The pear- and apple-like quince is a rarity on our shopping lists and in supermarkets. But the fruit isn’t entirely innocent for this: It has a hard shell, a woody, hard-to-remove core, and can’t be eaten raw–these are quite the arguments for not buying the fall fruit. But if you hang in there and give quince a chance, you’ll be rewarded with its delicate aromatic and ripe, fruity flavors. After a short cooking time, the fruit is already soft to the bite, and your kitchen will smell citrusy-fresh! What’s your favorite recipe with quince? Tell us in the comments, then upload a picture of your creations for all to enjoy! 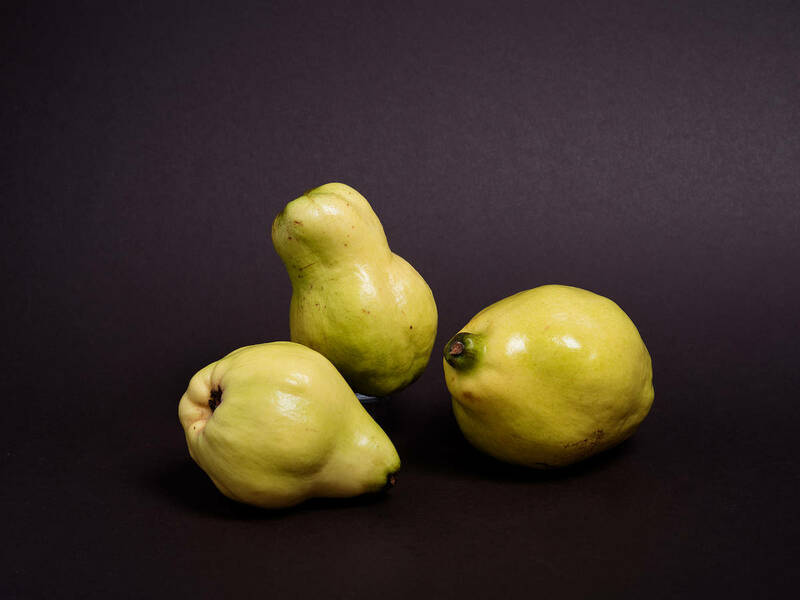 Quince is low in calories, consisting of almost 80 percent water. Under its hard shell, a quince offers a good dose of vitamin C that supports our immune system especially in the wet-cold months. In addition, it also contains more useful minerals like iron, zinc, potassium, and calcium. The fiber pectin has positive effects on digestion and helps to detox the body. Depending to its size, you can distinguish apple and pear quinces. Apple quinces have a harder, dry fruit pulp and are not that sweet, but more aromatic in taste than the softer pear quinces. The season for these bright yellow treasures is between September and November. During that time, you’ll have the best chance to find a perfect quince on the market and in organic stores. Since quince is sensitive to shock, they often get brown spots while being harvested. However, these don’t have any negative effects on the fruit’s quality. Even a brown-grayish bloom on its skin is nothing to worry about. This coat serves as a protection from any weather influences and will disappear with increasing ripeness. After buying quince, you should store it in a cool and dry place. Stored like that, they will stay fresh up to eight weeks. However, as soon as the pulp discolors, it’s time to cook them! Before cooking with quince, you always have to wash and clean each fruit thoroughly, since the outer protection bloom contains bitters. Afterwards you can peel the fruit, then halve or quarter it, and remove the core. Cut the fruit flesh and cook it in a saucepan or steaming pot. To prevent the fruit from turning brownish, add some lemon juice or quince peel to the cooking water. If you want to enrich its flavor, you can also add vanilla sugar, cinnamon sticks, star anise, ginger, or cloves to the water. To prepare quince jam or jelly, it’s best to buy greenish fruits that are not fully ripe yet. They contain a lot of pectin, which helps to get the perfect jam texture!